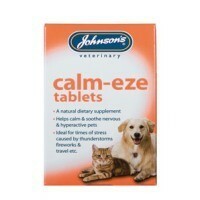 Johnson's Calm-Eze Tablets for Cats and Dogs offer a brilliant solution to calming nervous or hyperactive pets. The natural supplements and amino-acids help to put your pet at ease. During times of heightened anxiety such as travelling and during fireworks, these tablets can prove particularly helpful. They are also effective in hindering aggressive, territorial behaviour. As with any medicated product, it is important you familiarise yourself with any additional information provided by the manufacturer before administrating.